Average rating of 3.5 stars from 81 reviews. 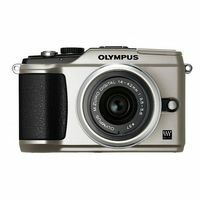 The Olympus PEN E-PL2, launched in January 2011 continues the Olympus PEN lineup and takes the baton forward from the very well received E-PL1. In this report we look at the newer features touted by Olympus with this launch and how they should affect your usage. We further round up around 33 reviews from the best digital camera experts online, including CNet, DigitalCameraReview, PCWorld and CameraLabs and look at what they have to say about the E-PL2. The E-PL2 is the result of the continued focus by Olympus on its Micro Four Thirds product lineup. The E-PL2 builds up on the easy to use, superbly designed and high performing predecessor, the E-PL1. The E-PL2 is being positioned as a mobile dSLR by Olympus. Even after including a flash and an image stabilization mechanism the size and weight of both the body and lens has been reduced. 1. A thoroughly updated user interface called 'Live Guide' with an improved Dial operation for easier access to most of the photographic parameters. 2. Improved and extended Art Filters and variations enabling a much deeper customization of each filter with different art effects and moods. 3. The M.Zuiko Digital 14-42mm f3.4-5.6 II standard zoom lens - extremely portable with a weight of just below 500 grams. 4. Fast and noiseless AF operation due to a new MSC (Movie and Still compatible) mechanism built into the lenses. 5. A large 3-inch LCD monitor (460,000 dot) for easy operatablity. The image quality is stamped with high approval from almost all our experts, including CNet, DigitalCameraReview, PCWorld and CameraLabs. There are almost no disagreements on this. TechReviewSource indicates decent pictures even in low-light and the experts at DPReview claim a decent performance and lower noise profiles even at higher ISO's . Even though various experts described the 720p HD video as 'gorgeous' there was some mixed results regarding other video aspects. PCWorld found the limit to only the AVI movie format disappointing and CameraLabs was not too happy with the sequential shooting performance. The autofocus has mixed reviews from the experts. DigitalCameraReview found the autofocus slow as compared to the other DSLRs, even though experts at CNet and DP Review disagreed and found the same to be fast and smooth enough. The smoothness claim was also questioned by TrustedReviews who reported some mechanical grinding noise with the autofocus. The ISO performance was claimed as decent by DP Review and they were pretty happy with the noise reduction profile also. Though the E-PL2 receives high marks from reviewers regarding its image, video and handling quite a lot of the claims made by Olympus were refuted by the experts. This includes the new user interface which did not pass muster with a lot of the experts - being frequently described as confusing and the autofocus which was often described as slow and noisy. Even though the E-PL2 loses out in the speed department it does stand out in its small, light and durable construction, with a neat retro design. The Olympus E-PL2 is a pretty good attempt by Olympus to create a compact DSLR and will appeal to most travellers and those who want to shoot great pictures on the go. The great feature set, with mostly positive reviews from experts (bar the AF slowness) at a very competitive price makes it a good offering.